So what have your PT training results been after a month or two? And to date? First two months, 20' power went from 315W to 335W. In the 18 months I've had the PT, I'm probably close to 365W 20' power right now. 1' power went from 614W to 690W in the first 2 months, 822W best. I like this chart to track my progress. It is mean maximal normalized power at various durations by week. I got my power meter at the end of August, the week after I won a cat 4 race with a 5" of 850W, 1' around 400W, 5' around 300W and a 20' of 270W. Unfortunately shortly after I broke my collarbone and it took a while to build back up. I had a huge jump at the beginning of this year when I switched from base to intensity. Recently I've had a 5" of 997W, 1' of 570W, 5' of 375 and 20' of 307W. I started training with power last year as a Cat 5. My initial 5" peak was 1000W, 1' peak was 400 watts, 5' peak was 300 watts, 20 min peak was 245 watts. Less than a year later, my 5" peak is 1400 watts, 1' min peak is 700 watts, 5' min peak is 400 watts, and 20 min peak is 320 watts. However, I was not a trained racer last year starting out, so my year 0 - year 1 increase will be much more than my year 1 - year 2 increases. I'm now a Cat 3 that targets Masters and 1/2/3 races to push myself more and continue to make a lot of progress. Everything has increased about 10%, but my 5" power has stayed the same. This is in around 3 months time span, with 9 months of haphazard training beforehand. we're talking AP here, right? Is NP good for anything other than making me feel 'not bad' about some of my rides? 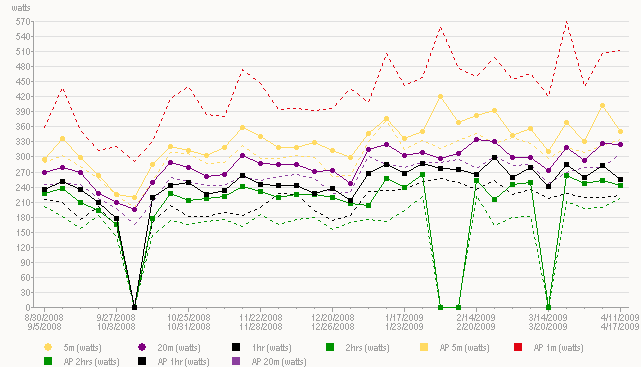 I was talking AP numbers, but my graph shows both. AP seems to capture the high training efforts well but NP seems better at capturing the hard race efforts. Often the AP will be pretty low but I'll still be wrecked at the end. NP seems to correlate with RPE much better than AP. So that's why I like to see both.